I've been wanting to visit Temecula after hearing such nice things about it, and this Christmas we finally did it. After spending time with family on Christmas eve (aka my birthday ;)) and Christmas morning, we drove out to our Airbnb in the heart of Temecula's wine country - about a 2 hour drive southeast from where we live in LA. The holidays can get a little crazy, and we were looking for a nice quiet place to relax and recharge - what we got went above and beyond that! I'd never been in an Airstream, and now having stayed in one I'm obsessed. Ours was so incredibly cute and cozy! We had a king size bed, a full bathroom with a shower, toilet, and sink, as well as a full kitchen and adorable living room. Our hosts even had a bottle of wine waiting for us as well as the preshest little Christmas tree. All the added little touches really made it feel like home. I got to enjoy a hot cup of coffee from the Nespresso machine every morning, and they had speakers with an auxiliary chord plugged in so we could listen to our own music. There was a little space heater that warmed the place right up at night, and there's an AC in the Airstream for the warmer months. There was even a full fridge and freezer for our leftovers and ice cream! 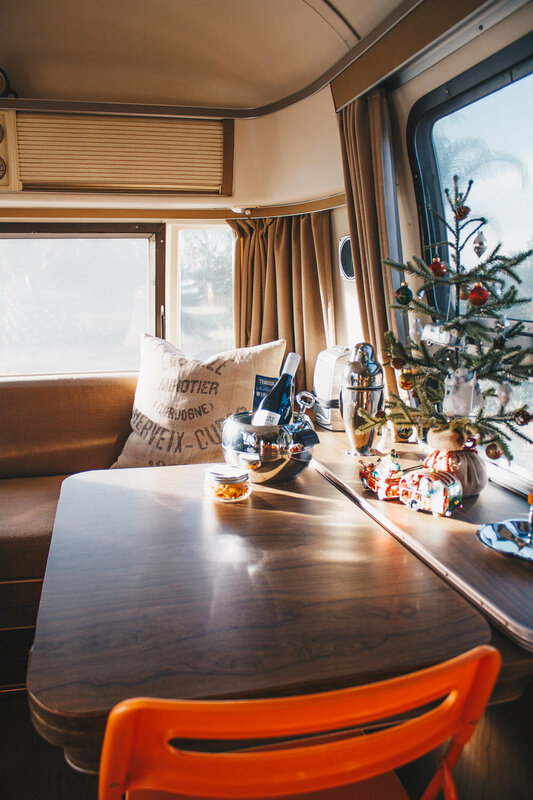 Our hosts really went above and beyond creating a magical getaway spot with this Airstream. We woke up every morning and walked outside to the most magnificent view of rolling hills and wineries - it really took our breath away. The airstream was also connected to an amazing patio and POOL! It was too chilly to take a dip but we can't wait to come back in the summer when we will be taking full advantage of the warmer weather. Our patio had a grill, an outdoor fridge, chaise lounges, a sofa, coffee table, and more. It really was amazing, especially when we found out our hosts actually made the majority of the furniture and art on the grounds themselves. One of my favorite things about this Airbnb was the outdoor heated shower. It was a jungley oasis! So so pretty, I couldn't get enough. Added to the #homegoals list - outdoor shower! Watching the sunset here was beautiful - cotton candy skies, snow capped mountains, rolling hills. One of the many highlights from our stay was this fire pit. Watching the sunset with a glass of wine and a blanket, toasty warm... Cozy heaven! This outdoor dining room was to die for. The chandelier! The tree! The view! Gimme gimme gimme. Even the birds are living in style! I could not recommend Temecula and this Airbnb in particular if you're looking for a little getaway. When we weren't at the Airstream relaxing, we were out at the many wineries doing wine tastings or in Old Town Temecula walking around enjoying the cute little shops. I'm so glad Eddie and I got to experience this magical place together, and can't wait till we can go back again!